Mothers are special. From earning a living to providing the kids with comfort and warmth, mothers do whatever it takes to make their child happy and healthy. 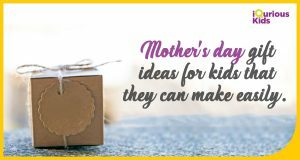 If you ask a bunch of kids what they love about their moms, we are pretty sure that they can’t just stick to one particular thing. Not certain? Well, ask yourself this question too!! The Little Picasso prints: Hey kids, what could be more special than your own handprints on the card you are making for your mother. So, let loose with finger paints and ask your siblings to join (if any). Oh and seek your Dad’s help to add cute snapshots of yourself in the card, and write about how much your mother means to you. A Bookmark for Mom – If your mom is a bibliophile, then this is just the right gift for her. Create a bookmark with a special message and your favourite quote from the book. Again, seek dad’s help for this and you can even gift her a new book, if possible.